Green lacewing adults emerge from the pupal stage to find an insectary planting of alyssum to sustain them in the greenhouse at Johnny's Research Farm, Albion, Maine. In the larval stage lacewings are voracious predators of the eggs and immature stages of many soft-bodied insect pests. Just as many vegetables and flowers thrive in the long, warm days of summer, so too do many insects and diseases. Every experienced farmer knows that some pest and disease pressure is inevitable. The challenge is to prevent pests and diseases from making crops unmarketable. The very best strategy is prevention, much of which involves an integrated approach. Study up on pest and disease pressures common on your crops in your area, so you know what to expect. The first step is to get informed. 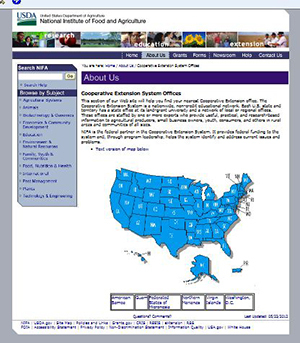 A good place to start is by getting in touch with your state/county Cooperative Extension Service. Their role is to provide timely, practical, research-based information on pest management issues specific to your region. There are also ample resources on the web to help you understand potential problems and deal with them before they get out of hand. If you haven't already, check to see if your state has an integrated pest management (IPM) program for the vegetables, flowers, fruits, or other crops you may be growing. In many states, the land-grant university system/Cooperative Extension Service offer fact sheets, education, and guidance on the most common threats to commercial crops in that state. Although there are some pests and diseases that are found in all parts of the US, there can be considerable regional differences, so it's useful to read the information for your own state and/or nearby states. Alternatively, you may find that pest and disease control information for your state is part of a larger "Commercial Crop Production Guide." Use that as your search term along with your state name, to see what's available for your geographic region. What you're looking for is a listing of the most common pest and disease problems on a crop-by-crop basis. Once you know the names of potential culprits, you can learn to identify pests at all life stages, from eggs to larvae to adults, and diseases by the symptoms they cause in susceptible plants. You can find good photographs in many online publications, or, if you want to verify the appearance of a specific pest, check out Insect Images, a grant-funded service offering photos of numerous entomological species of economic interest. This is not as big an undertaking as it may first appear, because most vegetables can be grouped into plant families with similar pest and disease problems. Rotations of vegetable crops should also be based on plant families. If you are not yet familiar with vegetable plant families, see the Referral Chart of Plant Families, a concise guide jointly published by Virginia Tech and the Virginia Cooperative Extension Service. If you don't want to be caught by surprise this growing season, take an hour or so now to find out what resources are available to help you be prepared for pest and disease problems. Do an internet search for "IPM Vegetables" or "Integrated Pest Management" + another crop- or method-related term, and explore the results for your own and nearby states. 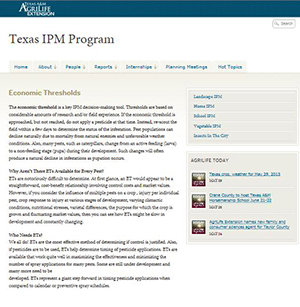 IPM programs are found across the US and throughout the world — you can learn a lot by researching your regional IPM resources on the Internet. 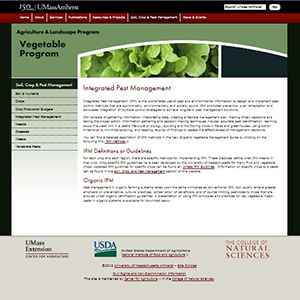 From UMASS Amherst to Oregon State University and in-between (University of Minnesota), a tremendous wealth of online resources exists for the motivated student of integrated pest management. Once you know which pests and diseases can affect your crops, you can start actively watching for them. If you farm on a small, labor-intensive scale, get in the habit of looking at both sides of leaves when you're tending your plants, to check for eggs and disease lesions. If you farm on a larger, more mechanized scale, you can set up traps for insects and schedule frequent inspections for other problems. Large vegetable farms often hire IPM consultants to do the monitoring, a field known as crop scouting. Whether you're growing on a small or large scale, there is a whole new generation of field instruments and apps available to enhance the effectiveness of the system you use to keep and eye on your crops. Some states have programs to monitor for pests and diseases that are a specific threat to economically valuable crops. For example, Cornell University has set up pheromone traps for sweet corn pests in multiple locations in western New York. The traps were monitored weekly and reports compiled about the presence of European corn borer, corn earworm, fall armyworm, and western bean cutworm. Because the life cycles of those pests are well understood and are dependent on cumulative degree days, extension specialists were able to predict outbreaks based on what they found in the traps. Sweet corn growers in the region can contact the service or check the NY/Cornell IPM website for updates, predictions on pest arrival in their fields, and related information. Integrated pest management is an ecosystem-based process by which pest problems can be solved with minimal risk to people and the environment. As the word integrated connotes, there are often overlapping, interactive, and synergistic effects between the different types of measures in an IPM approach, and all potential options must be given due consideration in view of the complexities of living systems. For nearly every pest and disease problem, there is a hierarchy of responses. Here are the key conceptual elements of the integrated pest management framework. 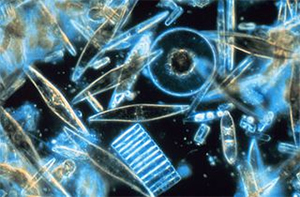 Comprised of the finely ground exoskeletons of fossil diatoms, the sharp edges of diatomaceous earth (DE) abrade the waxy or oily outer layers of insects, causing them to become dehydrated and die within a period of time ranging from a few hours to several days. Common target organisms are soft-bodied crawling insects such as ants, earwigs, cockroaches, silverfish, crickets, fleas, millipedes, centipedes, and even bed bugs. DE is thus a pesticide that falls under the category of a mechanical control. But because some organisms will not crawl, light, or feed upon plants that have been dusted with DE, it also functions as a repellent. The key disadvantage to DE is that it can be lethal to beneficial insects such as ladybugs and pollinators. It is also highly absorbent, so its effectiveness against pests is diminished by humid or rainy weather. It is nontoxic to birds and mammals, and because it contains no chemicals to which insects can build immunity, neither can they build resistance to DE. In IPM, treatments are made with the goal of removing only the target organism, so DE is not a universal solution but one which is fast, effective, nontoxic, and relatively benign under limited circumstances. Always read pest and disease control labels and follow instructions carefully. Cultural Controls. Once you know the types of problems that are likely, you can easily incorporate cultural controls as preventive measures. Fundamental cultural modifications include crop rotation, cleaning up crop debris, shifting planting dates to stay ahead of pest development, and using clean tools to prune and trim to prevent the spread of infection. Many problems can be avoided from the outset by optimizing soil quality — or if not growing in the ground, whatever substrate / medium being used — so that plants are vigorous and robust, able to withstand insect and disease pressure. Mechanical Controls. The second type of control strategies are mechanical means such as covering crops with row cover, laying reflective mulch to repel certain pests, hand removal, trapping, collars around stems, trellising, tillage in all its various forms, and ensuring adequate air circulation within a protected environment. Sound cultural controls together with mechanical controls form the abiotic basis of an integrated pest management framework. Biological Controls. In the next tier we find the bioactive realm, where the first step is choosing inherently resistant varieties. Biological control, or biocontrol, involves introducing living organisms — predators, parasitoids, pathogens, competitors, or symbionts — to help control pests and diseases through such natural mechanisms as predation, parasitism, herbivory, and displacement. Understand the economic threshold for your crop — before applying chemical controls. First, the cost of the products may be greater than the economic loss caused by the pest or disease. For some pests, there is an established economic threshold (ET), also known as the action threshold. By definition, this is the level at which control measures should be initiated to prevent the pest from causing economic injury greater than the cost of the treatment. You may find this information for some crops on your state or regional IPM website. Sweet corn pests have well-researched economic thresholds, but you may have to use your own judgment and experience to determine the ET for other pests. The second reason to make chemical suppression a last resort is because of the potential for pests and diseases to develop resistance to many control products. With both organic and synthetic pest control chemicals, resistance devalues useful, least-toxic products and leads to ever more toxic strategies, or to complete crop failure. The third reason why chemical control is increasingly less acceptable in sustainable systems — even where available, effective, and relatively benign — is because of greater appreciation of associated environmental costs and concerns about chemical residues in edible and ornamental products. To learn more about holistic IPM, we recommend an open-source opinion piece published by Swedish plant pathologist Johan Stenberg in Trends in Plant Science, A Conceptual Framework for Integrated Pest Management. By thinking about likely pest and disease problems early, scouting your plants regularly, and incorporating commonsense cultural and mechanical controls into your practices, you may be able to produce healthy crops with few overwhelming challenges. But sometimes, despite your best efforts, pests and diseases will threaten an important crop. When that happens, you will find a complete line of low-toxicity and OMRI-approved products at Johnny's.